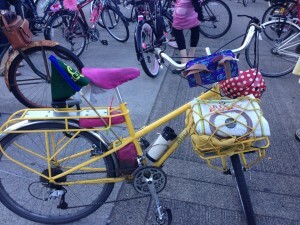 1) They are cute and stylish and are a bit less obvious and awkward than, say, a big, yellow waterproof pannier. Take them off the bike and you’d never know they are bike compatible. 2) They fit on bikes and racks that might otherwise have trouble fitting a pannier, as they have adjustable loops – so you don’t need a special rack, mount, or even a rack at all to carry things on your bike – that can fit over whatever part of your bike makes sense. 3) The small, woman-owned company supports great bicycle-based nonprofits, including the Community Cycling Center. Po Campo gave me a sample of the Six Corners Handlebar Bag and I tested it out by riding around for the first few days of Pedalpalooza, trying to strap it to various parts of my bike. This bag, though, gets much of its cuteness from its petiteness, but my giant wallet with keys attached unfortunately doesn’t fit in the bag without it being too snug to get out easily. It certainly isn’t for heavy packers. Things I found that could fit in this bag simultaneously are: one lipstick, one smart phone, one passport, one debit card, sunscreen, keys, a pen, a small notepad, and an energy bar. You could probably fit in a small light set in there as well. The Six Corners is great for bike rides where you’re heading somewhere fancy and you don’t want to carry a lot of stuff. I would highly recommend it if you have a bike that has trouble carrying smaller bags – the advantage is that even if you have a rack, this is easy for a short jaunt out without throwing in a larger pannier or strapping on the front rack with a bungee. 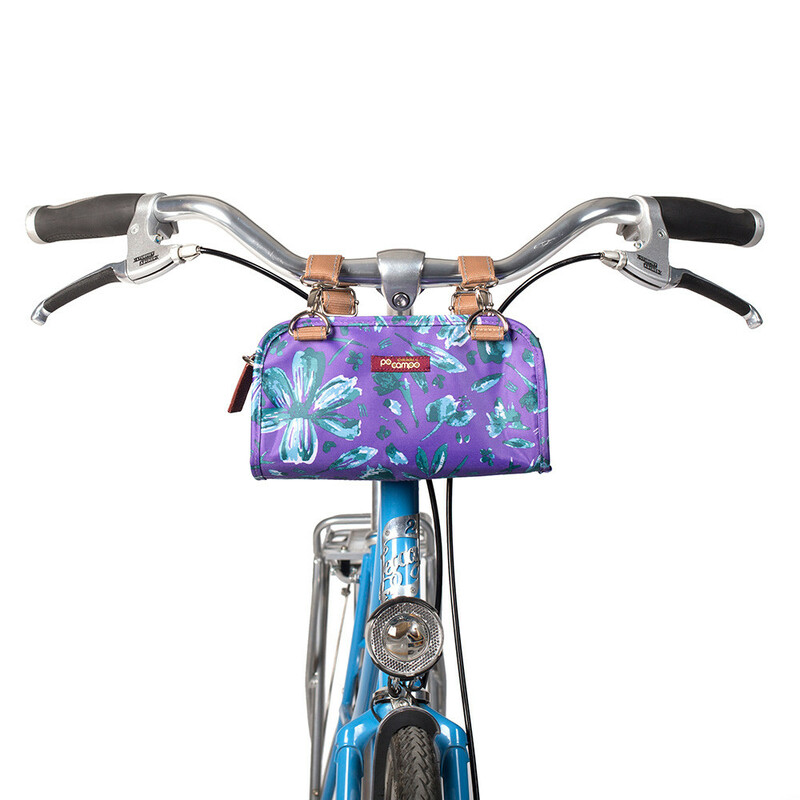 It’s absolutely perfect for a night out where you need more than nothing, but much less than a whole pannier or messenger bag. If you’re interested in supporting the Community Cycling Center and snagging one of these bags (or some other great bike-friendly bags), 50% of the proceeds from the Community Cycling Center Collection this week goes to support our Bike Club programs. If you use the code CCC, you get 15% off this week as well.